LEGO has posted on their Facebook page this nifty animation teasing us for an upcoming celebration of 40 years of LEGO Technic. According to its caption, "Wheels are spinning … get ready to celebrate 40 years of LEGO Technic! 🎂🎉🎈 Walk down memory lane with us when we are sending LIVE from the LEGO VAULTS, September 7 at 3pm GMT". You can see when in your part of the world the event is taking place by using a converter such as this one. The animation is almost as mesmerising to watch as a GBC layout, but I couldn't overlook something: how is the pneumatic switch on the right moving? It's been said that no more sets will be released for the 40th anniversary of Technic, but who knows? Anyway I can't wait for the 7th of September! On the 40 years anniversary of LEGO Technic, fans will have the unique chance to get a sneak peek into the LEGO Technic vaults. They will have the chance to take a trip down the memory lane and look back at some of milestones that have happened during the last 4 decades with 3 special guests: Jan Ryaa, the first LEGO Technic designer, Andrew Woodman, Senior Lead Designer on LEGO Technic and Signe Wiese, Culture Mediator at LEGO Idea House. 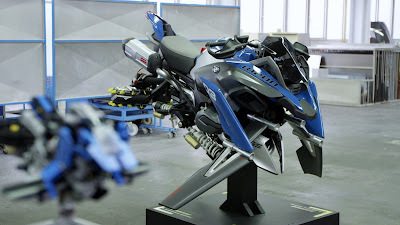 During the event, the fans will have the chance to ask questions to the guests and even get the chance to see their favorite (unbuilt) models right from the vault’s shelves. Rebrick has a new contest that should please LEGO Technic and BMW fans: Build to the Future! Participants are asked to imagine the ultimate BMW Motorcycle of the future – looking 50 to 100 years into the future. Models should primarily be made out of LEGO Technic elements, and have a BMW look and feel. One lucky grand prize winner will win a trip to BMW Motorrad Days in Garmisch-Partenkirchen, Germany, July 7-9th 2017, including airfare, hotel accommodations, and of course, entry into the event! They will also receive 42063 BMW R 1200 GS Adventure motorbike, signed by the design team, and a BMW Fan package, including a Silver BMW Motorrad roller pen, BMW notebook, Motersports hat, and Motorrad Lanyard. Nine runner-ups will also receive the signed 42063 BMW R 1200 GS Adventure motorbike and BMW Fan Package. The contest is open until May 4th 2017 at 10:00 a.m. 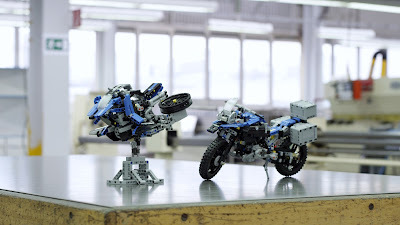 If you need inspiration, Milan "grohl666" Reindl, AFOL-turned-designer famous for his single-set MOCs (his 8294 Parrot being my all-time favourite) has made his own interpretation of how a futuristic BMW motorbike could look, using only elements from the 42063. You might want to take a look at the model and how it was built. Time to hop on and ride out! "For now, the program will continue to be offered to anyone interested in utilizing it but please do not expect any updates regarding functionality, the adding of new LEGO elements or glitch fixes. We have decided to pursue other digital experiences"
"We will not be doing automatic updates on elements, however elements will continue to be added from time to time. Unfortunately we cannot ensure that all elements are made available. I can see that the message has spread widely in the community since our original statement and I hope that you will assist us in spreading this message as well. Thank you!" So LDD was placed in some kind of limbo. No more automatic updates (whatever that was exactly meant to mean), but yes to occasional additions.One of the additions I would like to draw you attention to today is one that is related to the WeDo 2.0 set. regular channels. Fortunately buying LEGO Education sets has become a lot easier over the last decade. Especially in Europe there was a time it was almost impossible to but their products if you were not in some way related to an educational institution. Right now, virtually anyone can buy LEGO Education products and there are many more resellers than before. You can see high resolution images of the new elements and the new connector in my post on the new parts in the WeDo 2.0 set. Updates on LDD have been few and far between since the announcement a year ago, but LEGO is still adding to the digital design platform. The WeDo 2.0 elements are available for use! The easiest way to access them was outlined by Worawith Sirisuwan in the WeDo 2.0 Facebook Group. If you have already opened LDD then go to "View" [Step : 1], select "New Themes" [Step : 2] and from the menu that opens choose "LEGO MINDSTORMS" [Step : 3]. 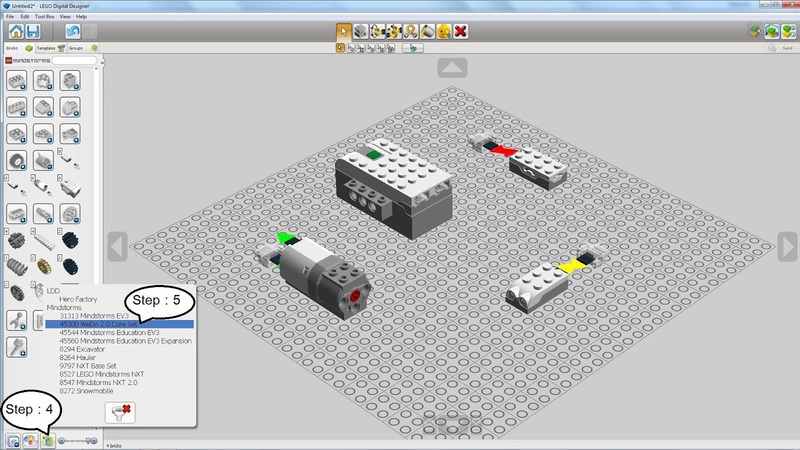 If the entry is greyed out that means you are already in the LEGO MINDSTORMS view of LDD. 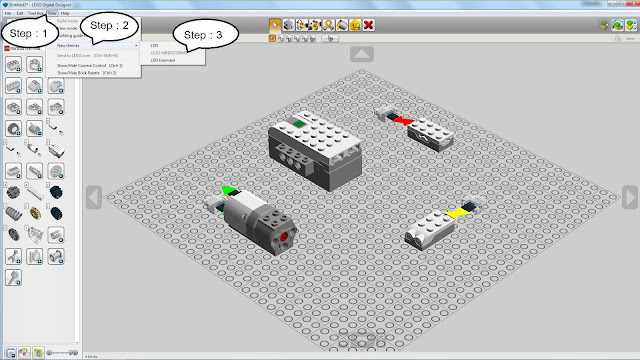 Next go to the bottom left of the screen and click on the LEGO set box icon [Step : 4]. In the menu that opens you can select the set 45300 WeDo 2.0 Core Set [Step : 5] (a curious name as there is only one WeDo 2.0 set and no add-on packs appear to be in the planning). You now have access to all the elements in the WeDo 2.0 set, including the electronics: the PF2 Hub, motor and sensors. The location of the elements is perfectly logical (within the LDD design). 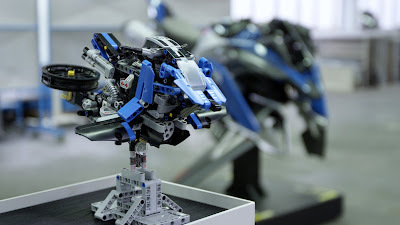 LEGO made a promising start by including the inventory of complete Technic in the specific LEGO MINDSTORMS area of LDD, but only a few sets were ever included. Not a place you'd go to much, unless you are in the habit of building digital versions of your EV3 robots. Important new elements are evidently still being added to LDD. This opens up the possibility that other new PF2 elements will also find their way into LDD. Of course, for that to happen they will first have to appear in the shops, but the next series of PF2 elements will be here in the second half of 2017! The AIOI supports Windows XP (Home and Pro), Windows Vista or higher (all versions). On 64-Bit Operating Systems it will install in the "Program files (x86)" folder. The Installer will NOT run on Windows 95, 98, ME, NT Ver 4, 2000, or XP below SP2. Many thanks to all the programmers who contributed to this release. The 2016-01 LDraw Parts Update has been now been released. This adds 572 new files to the core library, including 475 new parts and 43 new primitives. This update also includes updated versions of the colour configuration files (LDConfig.ldr and LDCfgalt.ldr) thanks to enthusiasm of Sven v. Beuningen and the co-ordination of Willy Tschager and Magnus Forsberg. Thanks are of course due to all the part authors who created or corrected parts for this release, including several first-time authors. The reviewers also play an important role in keeping files moving through the parts tracker and deserve just as much credit. You can preview the new parts in 2016-01 here, download the zip-file update or Windows install package here. Alternatively you can use the LDView menu option File | Check for Library Updates... to install the update. Please accept our apology for this being the only parts update of 2016. What parts are you looking forward to most? What will you build?